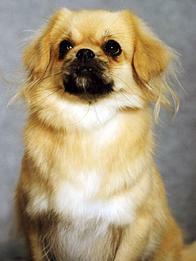 The Tibetan Spaniel is a most charming and highly intelligent little dog which originated in the Himalayan mountains of Tibet. 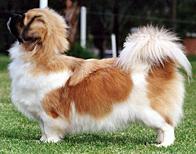 As a breed, it has been known for more than 2000 years, and was bred and owned by the Buddhist monks and lamas. Although legend has it that they turned the prayer wheels in the monasteries, it was as a watchdog that they excelled and still do to this day - their keen sight and hearing making them a valuable companion, especially to those who live alone. Tibetan Spaniels can live up to 16 years of age. Intelligent, mischievous, stubborn, and determined - all the traits comparable to a precocious child, and although at times they may test your patience they are soon forgiven because of their playfulness and wicked sense of humour and puppy-like characteristics that they retain their whole life. They are adept at problem solving and are very responsive to their owners. Tibetan Spaniels are equally at home in an apartment or a country property, although they do need to be adequately confined or they tend to go "exploring" due to their inquisitive natures. Because they have been bred for, and thrive on human companionship they do not make good kennel dogs, and are best kept in a situation where they have access to both house and well-fenced yard via a dog-door. Mixes readily with other pets. 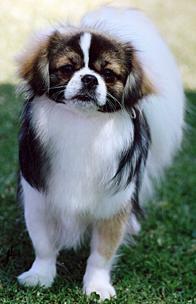 Being generally sound and healthy, the Tibetan Spaniel is an easy-care dog. Although the coat is moderately long it does not tend to tangle and has little odour. It has a double coat - a soft undercoat for warmth, and a longer silky outer coat which lies flat, and a regular bath and blow-dry keeps the coat in good condition. They are very active for their size, and need and enjoy regular exercise.